The study subjects were 134 Japanese with diabetes, hypertension and/or dyslipidemia who underwent measurement of visceral fat area (eVFA) by the bioelectrical impedance method and serum levels of EPA, DHA and AA. EPA/AA ratio correlated positively with age, and negatively with waist circumference and eVFA. Stepwise regression analysis demonstrated that age and eVFA correlated significantly and independently with serum EPA/AA ratio. Serum EPA/AA ratio, but not serum DHA/AA and (EPA+DHA)/AA ratios, was significantly lower in subjects with eVFA >=100 cm2, compared to those with eVFA <100 cm2 (p=0.049). Subjects with eVFA >=100 cm2 were significantly more likely to have the metabolic syndrome and history of cardiovascular diseases, compared to those with eVFA <100 cm2 (p<0.001, p=0.028, respectively). 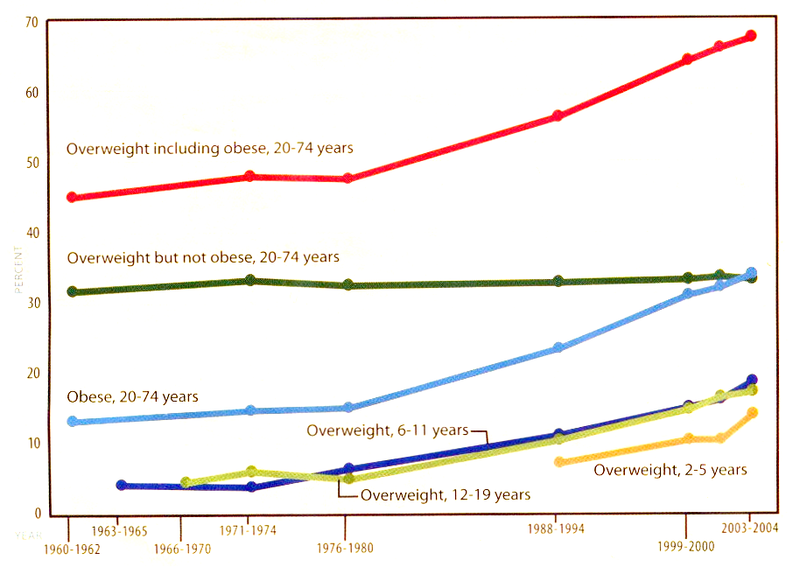 Evidence that obese people consume disproportionate more seed oil than non-obese people. The obese of the world have been eating seed oils like crazy the good patients they are, as ordered by the good doctors at the ADA and AHA. 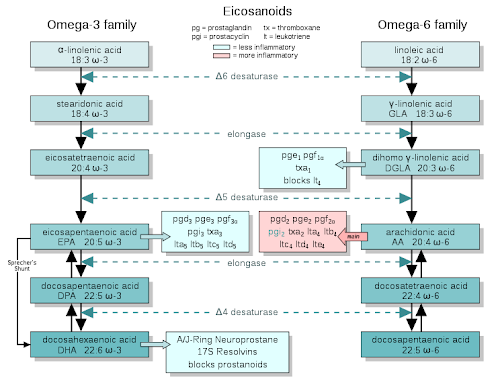 Linoleic acid (LA) gets metabolized into arachidonic acid (AA). 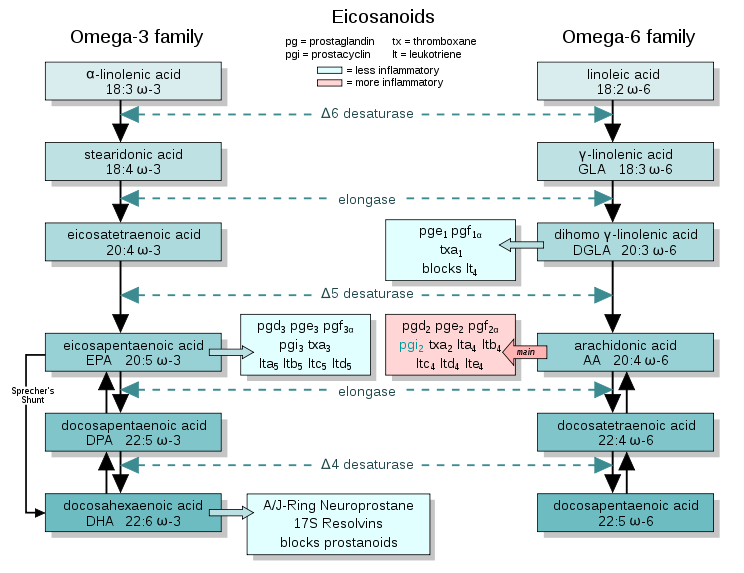 Alpha-linolenic acid (ALA) gets metabolized into eicosapentaenoic acid (EPA). Seed oil has an high content in poly-unsaturated fatty acids "PUFAs" (seed oil has an high content of ALA, and even higher content of LA), and seed oil has a low ALA/LA ratio. Consumption of seed oil (with its low ALA/LA ratio) will lead to a low EPA/AA ratio (like no other food) and it will increase the AA level like no other food. And this low EPA/AA ratio (that plausibly could only be caused by seed oil) correlates with obesity. BTW: AA in turn gets metabolized into "series 2 prostaglandins" which are considered to be "more inflammatory" (red box above). Furthermore PUFAs do negatively influence the carbohydrate metabolism and muck up the way insulin works (which will drive fat into fat cells). No other food contains as much PUFAs as seed oil. No other food allows you to raise your AA level like seed oil. No other foods allows you to lower your EPA/AA ratio like seed oil. No other food besides seed oil is necessary to explain obesity. Obesity? Caused by increased seed oil consumption. And look! Seed oil consumption has increased! 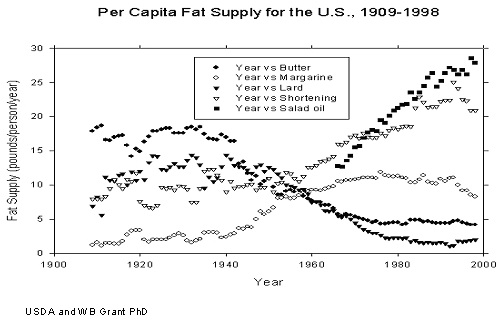 Consumption of butter and lard have gone way down! We are doing what the ADA and AHA are telling us! Thank god! And look! 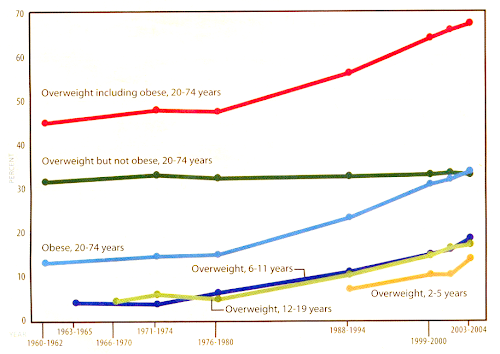 Obesity is up! Wonderful to see the marvellous advise of the ADA and AHA bearing such beautiful fruits! And look at this! 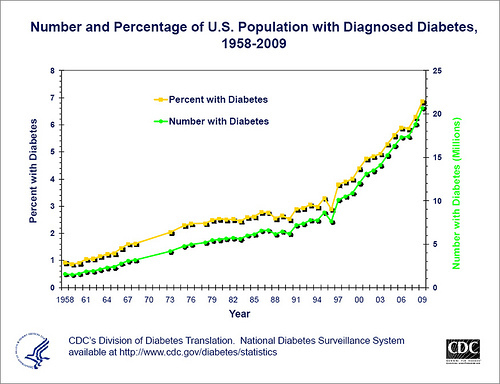 Diabetes is going up like crazy! It brings water to my eyes to see the success of the ADA and AHA! And look here! Heart disease is at an all time high! If that doesn't tell you that the ADA and AHA are doing a top job, I don't know what will. So avoid seed oils, if you do not want to become obese and run the risk of getting other "diseases of civilization". If on the other hand you do want to become obese, then follow the advise of the ADA and AHA and make sure you consume lots and lots of seed oil. One more thing, while we are at it: If you think you are a bird or a mouse – and who am I to judge – then I guess eating nothing but seeds (and the occasional bottle of cold-pressed olive oil) is a viable and healthy diet for you and other members of your species – but please don't counsel humans on their nutrition.